Typically, back-to-school night is big event on the school calendar. This opportunity for parents and teachers to meet and connect deserves special attention. We've gathered ideas and materials to help plan the evening, ideas to encourage attendance and participation, resources to share with parents, as well as materials to help parents make the most of back-to-school night and set the tone for a successful school year. Create a one-page summary of what your students will learn this year in class, so parents have an overall picture of the school year and how everything fits into the standards. Remind parents to read and learn with their children every day to build literacy and background knowledge skills! Represent the diversity of your school's ELL population and create a memorable back-to-school night display. Download this ready-to-print welcome flyer from Reading Rockets. Each child can fill in their favorite book titles and things they like to read about. Perfect for desktops or bulletin boards to welcome families to the classroom. In preparation for back-to-school night, have students design original name tags for their parents, or use these name tags from children's author Jan Brett. Everybody plays a role in ensuring children attend school regularly. Attendance Awareness Month is a nationwide event in September recognizing the connection between school attendance and academic achievement. The goal is to mobilize schools and communities not only to promote the value of good attendance but also to take concrete steps toward reducing chronic absence. Visit Attendance Works for community resources, including the Attendance Awareness Month Toolkit. 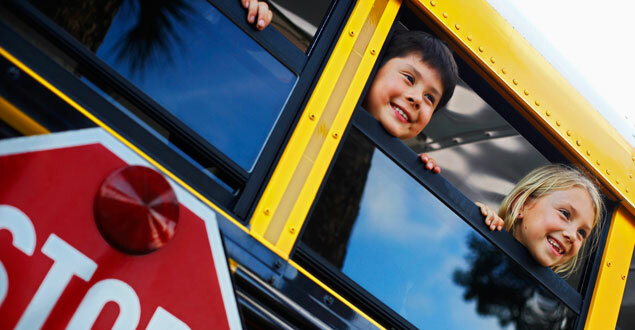 Dig into these back-to-school tips and resources on a wide range of topics, including preparing for the first day, taking a close look at your school's culture, and parent involvement strategies. Some Hispanic parents feel apprehensive about getting involved because of limited English skills, lack of familiarity with mainstream culture and the public school system in the U.S, and other reasons. Discover ways to reach out to your bilingual families. Read about classroom-tested ideas on how to host a successful bilingual family night for families. Parents love to know what's going on in their child's classroom, and a weekly newsletter is a great way to keep the communication going. Reading Rockets offers a ready-to-use, editable newsletter template complete with extra graphics and more than 50 reading tips. The Center for the Book at the Library of Congress publishes a calendar of book fairs by state. Plan an author visit for your school. Many authors welcome invitations — check out their websites to learn more. As a parent, you know your child best. However, the school counselor can help you better understand your child as a student. Learn how you can collaborate effectively with the school counselor to ensure your child's academic and social success. Tip #1: Create a smooth takeoff each day. Give your child a hug before she ventures out the door and you head to work. Look her in the eye, and tell her how proud you are of her. Your child's self-confidence and security will help her do well both in school and in life. See all 10 tips. For students with with learning disabilities and ADHD, it is essential to have effective parent-teacher communication and ongoing collaboration. Browse the many articles in Working with Your Child’s Teachers, from our partner, Understood. It takes a while for teachers to get to know their students. Parents, especially parents of special needs students, can help the process along by designing a dossier and discuss it at the first parent-teacher conference. Are You Ready? School's Open! Find lots more books about school with our Book Finder tool. Customize this list of personnel for your own school and distribute to parents at back-to-school night. School libraries are critical to every student's learning experience and academic achievement (learn more in this Scholastic report, School Libraries Work). Offer parents information about how to access and support your school library. For parents of kids in preschool through grade 3, these reading tip sheets are available in multiple languages. Subscribe to these free one-page articles for parents, in English and Spanish, on topics ranging from building background knowledge to helping your kids succeed in school. Do you have a reading rocket at home? Download and print this colorful bilingual door hanger. Small notes tucked inside a lunchbox or bookbag can really bring a smile to your child's face. In addition to reinforcing reading skills, you're also modeling the power of writing. Download these ready-to-print note papers. Find more great information in our Back to School section. I like the diversity of this article and the focus on teacher and parent collaboration. Students will always be more successful with the support of parents at home. As a future school counselor we can also help increase the effectiveness of this night by collaborating with teachers to provide more information to parents. This can help parents fee more prepared and ultimately help students and the school be more successful. Particularly the "Back to School" resources for parents would be a great opportunity for teachers and counselors to collaborate and provide parents and students with more information to have a smoother and more positive beginning of the year transition. I absolutely love the idea of a school offering a back-to-school night AND a parent orientation night. I think it really sets the foundation for success for everyone. I agree with Jeff Wright in the Back-to-School Night Basics article when he says, "It does help in that one night you deliver all the information, give the parents and students time to let that sink in, and then a couple of weeks later they come back and say, OK, here’s all the questions we have.” As a parent and a school counselor-in-training that really resonates with me. The goal should be to set everyone within the school community up for success - not to just check a formality off the school calendar. By offering an orientation in addition to a back-to-school night, students and parents are able to get a better sense of the wide range of resources available to them at their school with the hope that they will take advantage of them when desired or necessary. Information is power. I can't tell you how many parents I come across who are completely unaware of the wide range of resources offered by their child's school. Having both a back-to-school night as well as an orientation night is a step in the right direction. There are a lot of great tips here for setting the tone at the start of a new school year. As a graduate student in counseling, we have been learning about classroom management as well as counseling children and adolescents, and setting the tone has been a common theme across my courses. This is something that originally might have scared me a bit, because I am not a disciplinarian, and to me setting the tone sounds like setting boundaries and rules. However, this page helped me to understand that setting the tone at the start of a new year can be a positive, welcoming thing! It can take many forms, such as a newsletter to parents - strenghtening the parent-school relationship - or demonstrating the diversity of the school or classroom. I'm curious how this might translate for school counselors, but I could definitely envision myself using some of these tips to set the tone for a new year. As a future school counselor, this article made me very excited and full of new ideas to connect parents to their children's school and education. I personally have always found back to school events enjoyable as it is the start of something new, but can understand that to many the start of a new school year can be daunting- for both parents and students alike. Producing handouts and flyers in multiple languages promotes inclusion and access for parents who are not native English speakers, further involving the parents into the child's education. Parents usually know who their child's teacher is, but often may not be as familiar with the school counselor. As school counselors do often become a part of the student's education and well-being, I think that sending out a monthly parent update flyer or handout, with a section from the school counselor will create a beneficial relationship between parent, teacher, student and counselor. This back to school night layout is extremely helpful and something I would love to use in my school counseling practice. The reason I thought this was so helpful is because of the wealth of information provided. Often times, coming to back to school night can be overwhelming for parents, as they do not know what to expect. First of all having an open environment is extremely important, which is highlighted in the above information. I particularly liked the section pertaining to online resources, and the who's who in your school. Often times when students "fall through the cracks" it is because they/ their teacher/ parent/ guardian are not aware of the full situation, such as a possible challenge they are facing or need not being met. By providing this information, the teacher has the means to connect with the students parents so they know what to expect and how they can help their child. Along with this, the multicultural aspect of English language learners is very important, as often that attributes to children struggling without everyone knowing what is going on. This is a great resource with a creative way to get parents involved not just during back to school night, but for the rest of the year! This article gave great insight to teachers for kicking off the school year! Reading this article made me excited and reader to begin a new, successful school year. I think parents would really enjoy back to school nights if they are we're designed as the one in this article. I also think counselors could implement some of the ideas that were mentioned in the article as well. The article definitely set the tone to a new school year. I thought the one page summary of what the child would learn in the school year was an awesome idea. This help parents identify what exactly will be happening in their child's classroom. Back to school nights is a great networking experience for all teachers staff and parents, helps build relationships and strengthen the community and school culture. Welcome flyer is a good resourceful ideas as well as the weekly newsletters. Again, keeping parents I the loop is important. I was really glad to see the article mentioning inviting dads out specifically, they play a huge role in education too (great point). As a future school counselor I was also very happy to see 'introduce the school counselor' section. Being that counselor play a sufficient role in student education, academics, personal/social and career aspects, I think it is great to get to know who's who in the building. The print and share section was also a great resource as well. Parents will definitely benefit from those resources. This article did a great job of outlining things not only teachers could do to start the school year off right, but counselor as well. Great read!